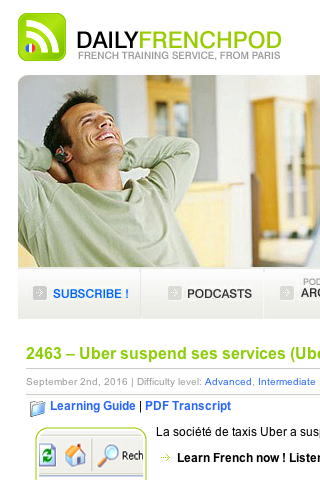 Daily French pod is a platform which offers daily podcasts for easy studying French language. Many podcasts have similar topic – Real Life French. Each lesson takes a simple situation a person may encounter in everyday life in France. Some of the other topics are – economy; history; politics; sports and lifestyle; music; arts; nature; society; health; technology; everyday life; hot topics; war; justice; gastronomy and many others. The podcasts could be used in class for practicing and later at home for exercising the material learnt at class. There are more than 2000 podcasts on different topics and for different levels – beginner; intermediate and advanced lessons. Podcasts are really useful for teaching and learning new language. The huge podcast database offered from this platform could be of great help both for trainers and learners. Complexity of the development / implementation of the content Medium. The site contains audio, video and pdf files to learn. It combines daily podcasts, variety of learning tools and a community of students/experts to practice with. Hardware requirements Computer, tablet, smartphone. Software requirements Flash Player required. Expected technological tendency/trend Medium. It uses podcast and has forum/Skype community.